We understand that with some of our cars there are emotional attachments. It is hard to say goodbye even after the car is no longer working. You look at hoarders and see that they need to let go, but even using your own rationale mind you find it hard to let go of that car (fill in personal story here). It goes from the driveway to the side of the house. Your wife demands that you move it because it is an eye sore, but you know the story and lived the story with that car. Overtime, the side yard is not good enough for your spouse and she wants it moved so the neighbors do not have to look at it anymore. Now you push it out of site and sits in your back yard. Your wife is happy until she goes to walk the dog and there it is. So you move it a little bit further back on the property. This way when you go to the second floor and look out the back window, the car is still with you. Not discarded, but on the family property. Now the demands get a little more serious and the time to make the call is closing in on you. It is like the fifteen year old family dog that you need to do what is right for the dog. Oops this is not the dog, but boy it is hard to let the car go. When it is time, it is time. 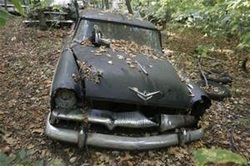 We will come in and move the car to its final resting place with dignity and sensitivity. Or perhaps your wife calls and just asks us to pick up the clunker. Either way, we will get out their with our tow truck, pick up the car and take it where ever it needs to go. Whether it is on your property or the transmission failed on the interstate and you need to move it quick. We are staffed and equipped to respond quickly and cost effectively. Give us a call right away if you need us to pick up your abandoned care. AST Towing is the best towing company. Give us a call or fill out the form on this page.